Five years ago this February, I got a phone call from my father. Hyla and I had been playing outside on a huge mountain of snow that had shed off our roof and I heard the phone ringing. I rushed inside to grab it. My father said he had taken my mother to the emergency room that day because my mother had been feeling ill for some time (we knew there was something going on because she had been coughing and feeling “off” for weeks; we later learned she’d been not feeling well for months) and things had gotten so bad, they didn’t feel they could wait for a regular doctor appointment. What they learned that day is that my mother had a large tumor in her abdomen and that she needed surgery right away to relieve her pain and see what they were dealing with. As often happens, especially in hospitals, one thing led to another, and surgery led to discovering the magnitude of the problem, as well as several severe and scary side effects, including a series of mini strokes that left my mother temporarily blind. Up until that time, my parents insisted that they were fine on their own, that my sister and I should just stay put, thousands of miles away. But after the blindness, my mother said, “please come,” and so we did. Somewhere in the hurried preparation for that trip south, it became obvious to us all that what my mother really needed to have was a stuffed giraffe. As crazy as this probably sounds to you, it made complete sense to us. She loved giraffes; she needed a stuffed one to cuddle and to cure her. Hyla was hip to this notion. She, above all other people I’m close to, knows the intense power of the perfect stuffed animal. 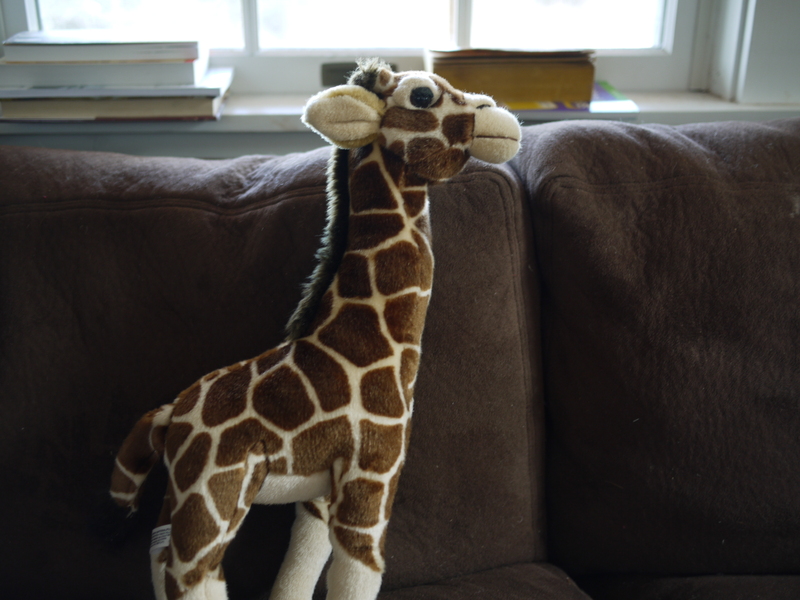 So, we called our only local toy store to ask if they had a stuffed giraffe, and, wonder of wonders, they said they actually had a few in stock. Off to the toy store we flew. We didn’t have a lot of time to shop around. My flight was the next day. The first giraffe we saw was clearly not the right one. It was small, and had few spots, and sort of looked more like a deer with a long neck than a giraffe. Then we spotted Akita. Akita flew with me in my carry-on luggage, and my mother hugged it tight in her hospital bed. Even though she could barely see us and was terrified of her new future, she smiled her trademark smile because, well, she loved giraffes. Over the three years of my mother’s illness, Akita traveled back and forth between Florida and Vermont, a running joke, and a token of love and shared understanding, over the miles. Out of the blue, Hyla would get a package from my parents and in it, among other goodies, there’d be Akita. And on our next visit south, Hyla would hand deliver the giraffe to my mother. At some point, Akita came back to us, but we never got the opportunity to return it to my mother again. She died the morning of January 7, 2008, a day before my sister and I were due to fly down for a visit with no prescribed end; the visit we knew would be our last. Among the things I’d packed in my suitcase were a pouch of my favorite yeast so that I could make my mother a loaf of challah (I never found Florida yeast that liked me), and Akita. Last weekend, I hurt my back, and, since then, have spent the better part of this week lying still so as to let things heal. It’s been boring, but I’ve had a lot of time to think, particularly about my mother, who spent the last several months of her life in a lot of pain, sitting or lying still, watching the world move on without her. And, in and odd way, it’s been a sort of comfort to commune with her in this still, quiet way. This morning, I began to feel a bit better, and was able to make breakfast for Hyla and help her pack her backpack for school. After awhile, though, I had to lie down on the couch, and I listened to Michael and Hyla prepare for their day. Just before they left, Hyla came in for a hug, and then she handed me Akita. We hadn’t talked about her grandmother yet — I was saving that for this afternoon — and she doesn’t know the date or its significance. She just somehow knows deep in her heart that a giraffe can make it all better. Extremely beautiful and touching post. BTW – I too know of the “intense power of the perfect stuffed animal”. I know exactly what you mean. Just beautiful, Rebecca. I’ve missed you. Thank you, Chrysa. I’m so glad you’re out there! That may be the most beautiful blog that I have ever read. I am so sorry that I am only reading this now. So beautiful. So true. And since I know it’s never too late to get some love, I send it fully.